Fitting carpet rods to a stair runner carpet is not difficult. You can ask your carpet fitter to do it for you or do-it-yourself. There are various styles of brackets suitable for runner carpets. The best ones are hinged, which slot together and come with ranges such as the Premier rod design, Vision and Country. They make life so much easier than the all-in-one, fixed versions. A good quality bracket will lift the stairrod high enough off the step to cope with a decent thickness of pile and underlay. Be careful, some of the cheaper ranges on the market come with brackets that are so thin that the thickness of the carpet and underlay bends the rod. 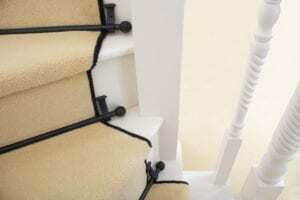 Remember: your carpet runner should be attached securely to the staircase by some means other than your staircase rods. When stair rods were first invented, back in the 19th century, they held the runner in place but, in reality, the runner would gradually slip down the staircase and rucks would appear and the carpet would wear unevenly. Today, a carpet runner is typically fitted with gripper along the edges of the stair tread and the stair rods are therefore decorative. A typical example is the solid brass Premier, which comes in two sections and fixes together to form the hinges. 1. Fit the carpet runner first. 2. Start at the bottom of your staircase – it is normal to fit a one at hall level. 3. Place the bottom part of each pair of brackets either side of the runner, adjacent to the edge and in the angle where the tread joins the riser. 4. Screw in the top screw – this will be internal and invisible once the rod is placed in the bracket. 5. Take your stair rod and place it centrally in the open brackets making sure you have the same amount of over-hang on both sides. 6. Attach the top section of the brackets and screw in the second screw, which will be visible. 1. If you have a fitted carpet you can choose either the front fix or the side fix style of brackets – both are robust, solid brass, fixed brackets able to cope with the thickness of a carpet and underlay. 2. Fit the stair carpet first. 3. Start at the bottom of your staircase – it is normal to fit a rod at hall level. 4. Locate the centre of the staircase and position the centre of the stair rod over it. 5. Carefully position the 2 brackets over the rod and equal distance (approximately 5cms) from each end of the rod and screw in through the carpet onto the step riser (back of step). In this way each step will line up with the one before. 6. If your rod is triangular in profile, such as the Royale, make sure you place the finished face so that it is showing. If your staircase is winding or spiral, it is easiest to use a stair rod design with a universal bracket, such as the Blacksmith. These brackets can be easily fitted at a slight angle, which is ideal. If your brackets are standard, like those for the Premier or Vision stair rods (see above), then you will need to likewise fit at a slight angle, working out each step individually.